Do you know how sometimes movies, plays or musicals open, you want to see them but can’t make it and suddenly their run is over? 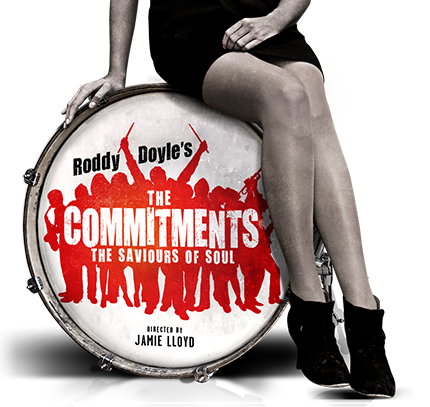 When The Commitments opened in 2013, I wanted to see the show, but somehow it never happened. When I noticed the day I was flying to London for a meeting the next morning was also that of the last two performances, I decided to try my luck. Mixed reviews be damned and dernières are sometimes more fun than regular performances anyway. I always loved the movie, and a big part of its charm has always been that it’s far removed from the typical shiny Hollywood fare, so I was really hoping they didn’t polish the characters and music to death. The fact that Roddy Doyle – who wrote the novel and was in the house that evening – also wrote the book for the musical was cause for hope. Same for Jamie Llyod being the director. In the first half, there was actually not that much music as the songs the band rehearsed got cut off in the middle. The audition scene was even funnier than in the movie and if someone starts to snicker next to you when R2-D2 comes on screen during the new Star Wars movie, let’s just say there’s a possibility they saw The Commitments and there are things you just can’t unsee. I remember making some mental notes about probably very valid and smart points about the actual show, but they were made completely irrelevant by the fun that came after. You got me there, you feckers. The second half had a lot more music, especially at the end where the band reunites and belts out all the big numbers from the movie. Not only did this part make everyone rise from their seats, clap and sing along (even the Australian rugby fan mourning his team’s loss next to me was rather enthusiastic at that point), the emotional speech about this being the last performance didn’t even leave jaded old me cold. There were tears and beers on stage, but every note was held perfectly and the obnoxious guy in the first row finally got shut up by Brian Gilligan (Deco), much to the delight of everyone else in the theatre. I am glad to have gotten the chance to see the show after all and will miss the familiar sight of the drums, sax and trumpet on the Palace Theatre the next time I walk by. This entry was posted in Live, London (UK), Reviews and tagged Alan Williams, Alex Tomkins, Amy Penston, Andrew Linnie, Ann Yee, Anthony Hunt, Barnaby Southgate, Brian Gilligan, Christopher Fry, Daniel Lloyd, David Grindrod, Denis Grindel, Emily Olive Boyd, Fiona Carty, Glenn Speers, Hollie O'Donoghue, Jamie Lloyd, Jessica Cervi, John Currivan, John McLarnon, John Sutton, Jon Clark, Julia Worsley, London, Mark Dugdale, Mark Irwin, Musical, Natalie Hope, Padraig Dooney, Palace Theatre, Peter Mooney, Roddy Doyle, Rory Madden, Ryan Gibb, Sam Fordham, Sarah O'Connor, Soutra Gilmour, The Commitments, Theatre, Thomas Snowdon. Bookmark the permalink.